Mackenzie Allen Philips' youngest daughter, Missy, has been abducted during a family vacation, and evidence that she may have been brutally murdered is found in an abandoned shack deep in the Oregon wilderness. Four years later in the midst of his "Great Sadness," Mack receives a suspicious note, apparently from God, inviting him back to that shack for a weekend. 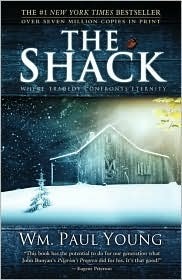 Against his better judgment he arrives at the shack on a wintry afternoon and walks back into his darkest nightmare. What he finds there will change Mack's world forever. "The person who lives by their fears will not find freedom in my love. I am not talking about rational fears regarding legitimate dangers, but imagined fears, and especially the projection of those into the future. To the degree that those fears have a place in your life, you neither believe I am good nor know deep in your heart that I love you. You sing about it, you talk about it, but you don't know it." What an awesome book! Thank you, Mr. Young, for sharing this with the world.